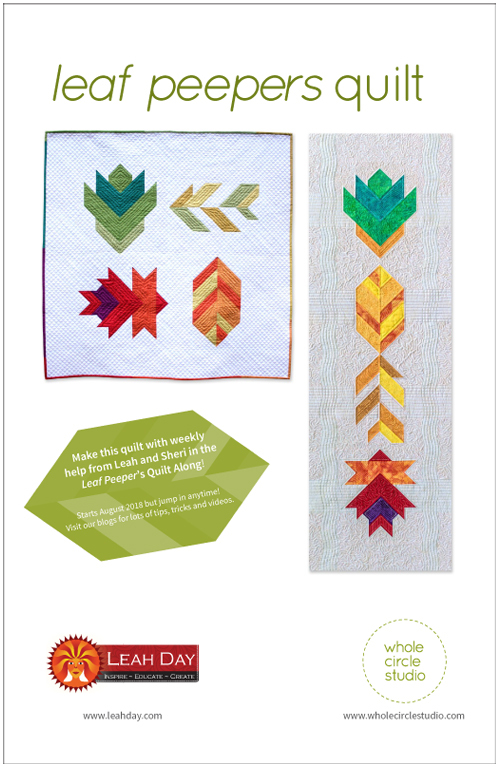 Our Leaf Peepers is pieced and we’re now ready to get quilting! 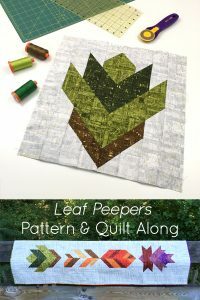 If you haven’t already, be sure to check out the introduction of the Leaf Peepers quilt pattern and Quilt Along here. I like to match my thread colors to my fabrics. 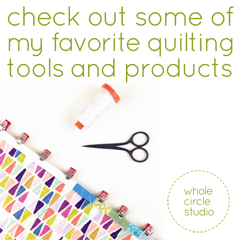 By doing this, my quilting compliments rather than competes with my quilt top design. 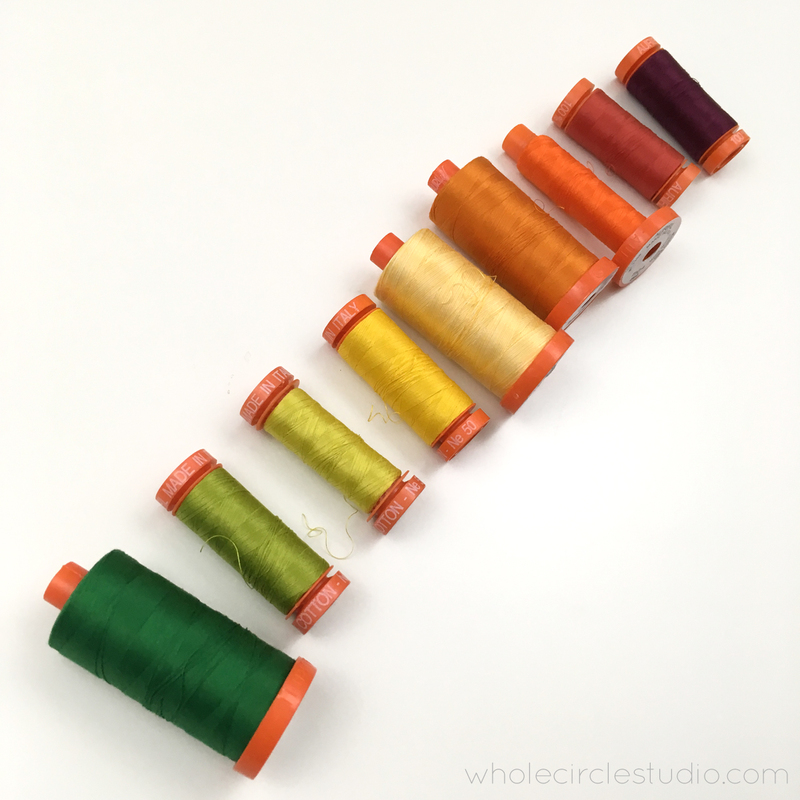 Here’s another tip: sometimes a thread color won’t look like a good match when it’s on the spool. Many times if I unwind a strand of thread and place it over the area I want to quilt, it’ll be a much better match. When deciding on a quilting strategy, I often study the seams in my quilt top and use them as a guide to quilt with my walking foot. 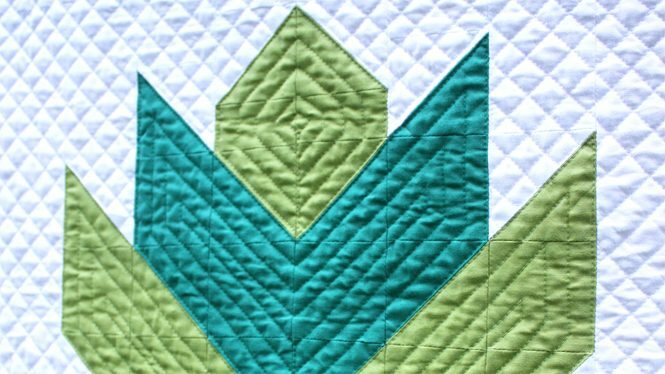 By using this strategy, I emphasize the design of the pieced top and make it the star of the quilt. I began by quilting each of the leaves. I first outlined each color shape, using matching Aurifil 50wt cotton thread (see list above—I used 2970, 1147 and 5015 for quilting Block 1), stitching just to the side of the seam. 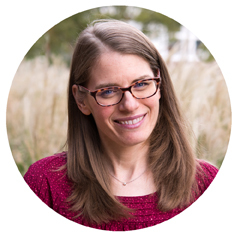 At my quilting starts and stops, I pulled my bobbin thread to the top, knotted it with my upper thread to hide, or bury, the thread tails in between my quilt top and batting. 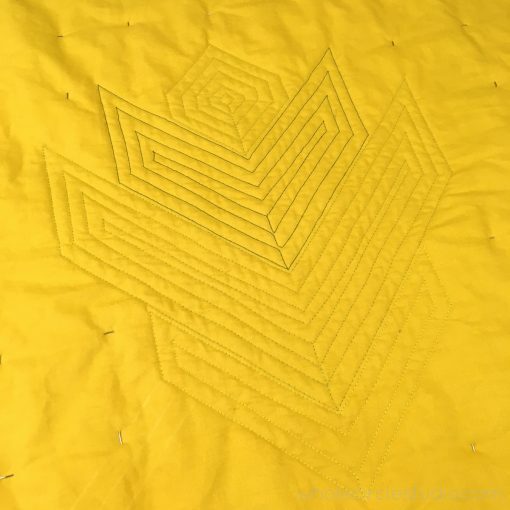 When I returned back to the point where I started, I “traveled” or quilted to position my needle where it would be in place that I could then use the toe of my walking foot as a guide against the line I just quilted. 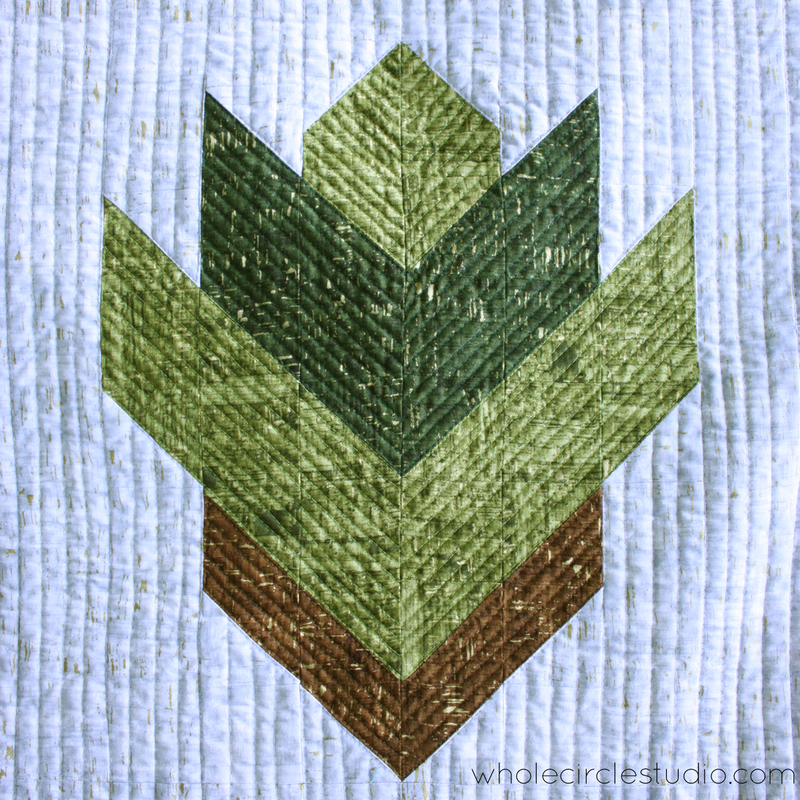 This enabled me to quilt parallel to the lines I previously quilted in the color shape. 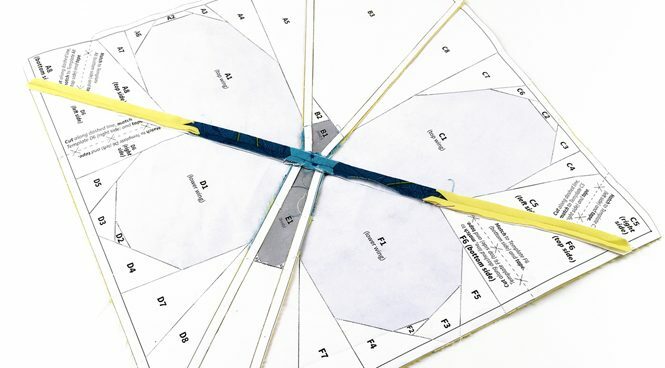 I then continued with this method to quilt the next lines if there was still space to quilt. My quilted lines are ⅜” apart because that is the distance between my needle and the outer edge of my walking foot toe. You can adjust the spacing to your taste or the distance between your needle and walking foot toe. Block 1: Solid version quilted using a walking foot. 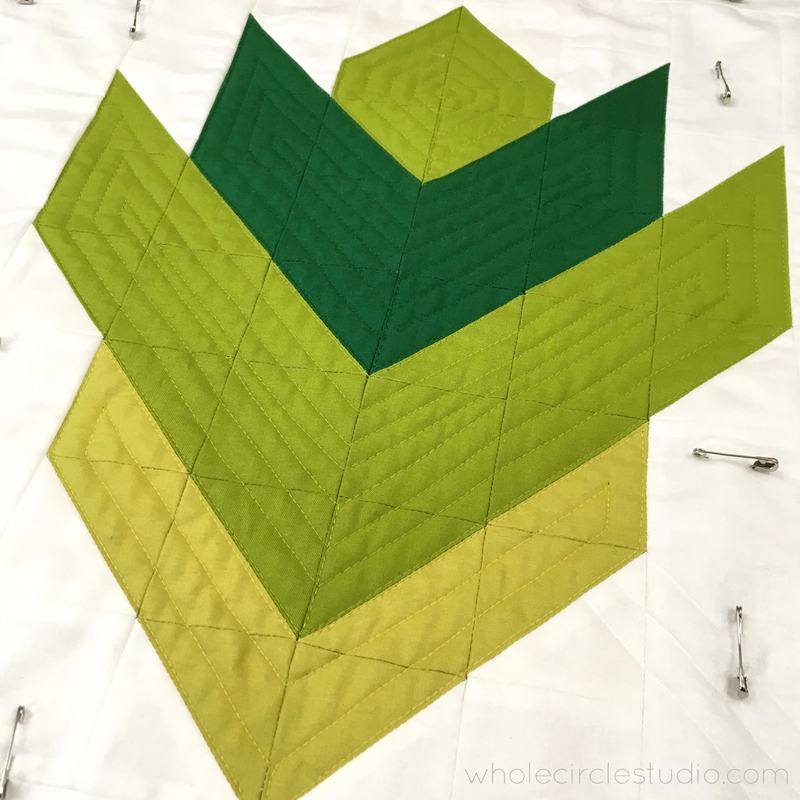 view from the back of the quilt | Block 1 : Solid version quilted using a walking foot. Block 1 : Uncorked version quilted using a walking foot. We’ll get to quilting the background in a couple of weeks. 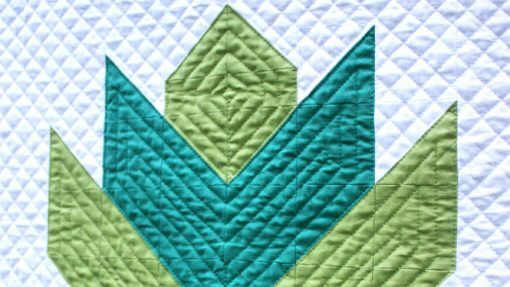 Be sure to check out Leah’s blog for a tutorial for how she quilted her block with Echo Ditching. It’s amazing how different the same quilt looks with different fabric choices and quilting techniques! 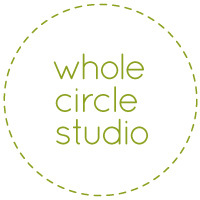 Next week, we’ll quilt Block 2.